Donations meant to “inspire the next generation” to play the ukulele. This year, The Salvation Army was one of three organizations to receive ukuleles from the Ukulele Foundation at the 9th Annual Ukulele Picnic of Hawaii at Kakaako Waterfront Park. Thanks to Mr. Kazuyuki Sekiguchi, Executive Producer of the event and founder of the foundation, keiki (children) across Oahu (Honolulu, Waianae, Kaneohe, and Kapolei) will have access to ukuleles in their music programs. Sekiguchi presented the first ukulele to a Salvation Army keiki and said the donations were to “inspire the next generation” to perpetuate the art of ukulele playing and create beautiful music. 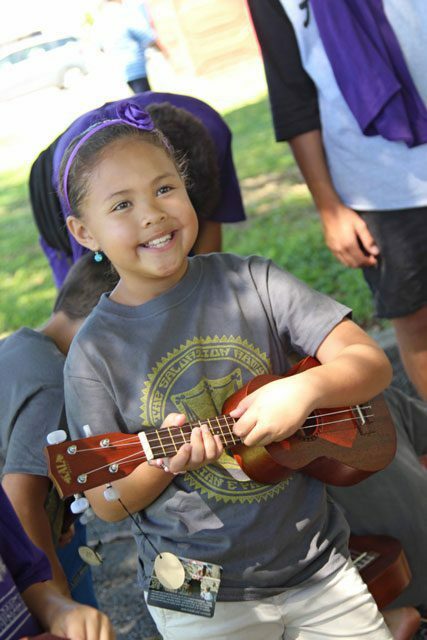 The Salvation Army thanks the Ukulele Foundation of Hawaii for its generous donation to thousands of keiki served throughout its programs. Majors John and Lani Chamness are the Hawaiian and Pacific Islands Divisional Leaders.